For millennia, man has been using herbs … in food, for healing, and for magical purposes. Only in the last hundred years have the magical and medicinal properties of herbs been separated by scientists and the magical community. This book reunites the two into a comprehensive reference. Drawing on her years of practice and research, Deborah Martin has compiled information on over three hundred herbs. Avoiding the confusion of common names which can vary by region, she uses the Latin binomial (scientific) names for all the plants but gives the reader a cheat sheet for easy reference. Written with a touch of humor, she details the difference between synthetic drugs and herbal alternatives. Lists make looking up an herb for a simple ailment or magical spell effortless. Also given are instructions for different types of herbal preparations and their medicinal and magical uses. Still not sure you’re interested? Here’s a Teaser. Herbs: Medicinal, Magical, Marvelous! (O Books ISBN 978-1-84694-372-0) is available through various online retailers, ask for it at your local bookseller or … you can order it from my shop (ADD TO CART BUTTON) and I’ll autograph it for you! What People Have Said About Herbs: Medicinal, Magical, Marvelous! The study of herbs is an extensive one, particularly if you are interested in both the medicinal and the magical attributes of plant life. I have been using herbs for both medicinal and magical uses for almost ten years, and I am certainly no expert – frequently having to refer to reference material before using any herb. But witchcraft is a holistic belief system, which works with life force. We believe there is a vital life-force which connects both body and spirit – to cure the body is to also cure the spirit, and vice versa. It is frustrating at times when one must consult two or more books in order to approach the problem from both angles. ‘Herbs: Medicinal, Magical, Marvelous!’ combines these studies of herbs, and in my opinion, this book is long overdue! The study of herbs can at first appear overwhelming. This book, however, demystifies the practice and presents the material in a humorous yet authoritative manner. The author explains the structure behind the Latin names, which otherwise can often confuse the beginner, and gives details on the differences between synthetic drugs and natural alternatives. She also details how to work with herbs safely, and references to astrological correspondences whilst also giving a simple ailment list which enables the reader to quickly find a cure for their problem – magically and medicinally. This book is truly a ‘how-to’ guide. Many books on herbs will tell you what to do but not how to do it; this book explains in simple terms who to use herbal preparations, and the ‘cheat sheets’ make for simple referencing, giving the reader a concise overview of each herbs’ use and the safety precautions. Genuinely magical and marvelous, Herbs, Deborah J. Martin’s herbal, is an excellent resource for anyone interested in plants, spell casting or traditional healing. Martin points out an extremely significant fact: when it comes to botanicals, it is not always easy or even possible to separate metaphysical and therapeutic properties. Herbs: Medicinal, Magical, Marvelous! is that rare book that focuses simultaneously on different aspects of plant powers, not just one. Herbs is well organized, detailed, fun and highly recommended. Keep a copy beside the herbal medicine chest and your Book of Shadows. If you’re searching for a thorough and accurate herbal resource that combines the medicinal and magical aspects of plants, look no further than Herbs: Medicinal, Magical, Marvelous! Deborah Martin’s years of knowledge and experience with witchcraft and herbs translate seamlessly into a cohesive source of information that can function both as detailed reference and written journal. All green witches, from novice to adept, will find this book to be invaluable in their day-to-day craft. If you enjoy the tremendous value of herbs, medicinally and magically, this book is a must-have for your library. Concisely written, this is a comprehensive reference about herbs, their history, preparation, inherent qualities and how to safely incorporate them to your daily life! Enjoy this lovely book from Master Herbalist, Deborah J. Martin! As a Hereditary Witch, I have grown weary over the years of every wannabe and pseudo Witch, picking up a book in a store, watching a movie (OY!) or hanging with other wannabes and suddenly they’re a Witch. So not being sure what to expect, I hesitantly dug in to this – what ended up being – marvelous little book. Unlike most herbal books that have littered bookstores over the decades, this book doesn’t just throw a bunch of names at you and leave you hanging with no idea of what to do, how to blend, make, gather, etc and make you more confused than you were before you began reading. The lovely thing about this book are the logs that the author has conveniently tucked in for you to make your own notes and diaries, if you will. This book is jam-packed with helpful tips and though I don’t agree with all of it (I have no use for candle magic or anything that relies on some ‘force’ other than yourself, for power, I would have liked to see more on growing your own herbs and how to make use of what nature provides than simply assuming that everyone wants to or will run out to the store or the Internet for their seeds, etc., and I could have lived without the list of suggested authors to read – I have my reasons for not reading/recommending some of them) I recommend this book for anyone who wishes to research herbal knowledge or add to what they already have. 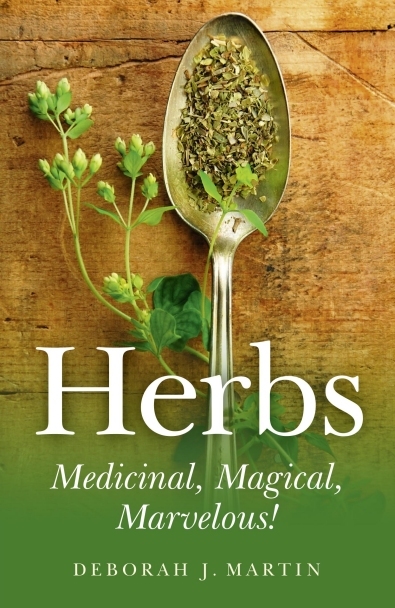 Recently I acquired Deborah Martin’s book Herbs: Medicinal, Magical, Marvelous! and being an ‘herby lady’ myself I was thrilled with the concept of an easy reference book listing hundreds of herbs and their properties. Granted, there are books on the market that do the same but Martin’s book is equal to, if not better than, those currently on the market. Martin starts off by explaining a little of the history of herb use and how it is making a comeback into mainstream society. She also goes into detail about how and why herbs are given Latin names, which is important as the later text is alphabetized according to the scientific names of the plants. Martin does this because, as she states, “many herbs have the same common name and it’s easy to confuse one with the other” whereas the Latin names are unique to that plant. This ensures that when a person needs to know about Lemon Balm they are looking up “Melissa officinalis” rather than “Monarda fistulosa” which is Bee Balm. When using herbs for medicinal or magical practice, it is never wise to confuse two different herbs as some herbs can have toxic or adverse effects. However, for those not fluent in botany, there is a “cheat sheet” guide that lists all the herbs by their common name. Simply look up the common or folk name and the Latin name is right next to it, then thumb to the Latin name in the main part of the text. Martin also divides the book into Appendixes for Medicinal Uses, Magical Intentions, and Herbs by Element with each section listing all of the herbs corresponding to that use or intention. This makes for another quick reference and comes in very handy for a quick look-up and gives options on which herbs to use for a particular matter. The main text is, of course, the herbs listed by their Latin names. Each herbal listing also includes the common name, family, medicinal uses, parts used, magical intentions, the element and planet correspondences and any cautions needed in working with that herb. Martin’s book is not a recipe or cookbook, in the introductory text she does go into detail all of the different ways to use herbs such as oils, tinctures, potions, creams, sachet bags, incenses, wines, water, poultices and many more and she gives information on how these can be achieved. However, there are no individual recipes combining herbs or recipes for uses but that is not what the book is meant to be. Martin’s book is about the herbs and their properties and she encourages people to come up with (and write down) their own recipes. However, it could be combined with a recipe book of herbal uses to create an awesome herbal reference library. But, whether combined with other herbal books or stand alone, Martin’s book is a must for anyone who works with herbs.